As with many other Zynga games, CityVille is hosting its own Mother's Day event, offering users the chance to purchase two new businesses, along with offering a discount on City Cash. 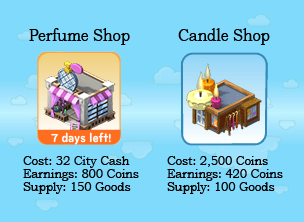 The two businesses are the Perfume Shop and the Candle Shop, with the Perfume Shop being available only for the next week. The Perfume Shop, being the more exclusive item, costs City Cash - 32 City Cash, to be exact. You'll supply the business with 150 Goods to get started, and can then collect 800 coins from the building by default. The Candle Shop, meanwhile, costs just 2,500 coins to build, and requires only 100 Goods to run. You'll earn 420 coins each time you collect from the building, without the help of any surrounding bonus decorations. As for the City Cash "discount," this is again a situation where bonus might have been a more appropriate word. For all players that redeem a Game Card (bought in the real world) or an eCard (bought online), you'll receive 20% more City Cash than you would normally. You won't save any money on your purchase of the Gift Card or eCard - your money will just go to buy more City Cash in the long run. This sale will be available until May 8 at 9PM PST, so don't miss your chance at free City Cash while it's available!